We gotta be – we gotta do better to see that our defense of marriage is not reduced to an attack on gay people. And I admit, we haven’t been too good at that. We try our darndest to make sure we’re not an anti-anybody. We’re in the defense of what God has taught us about – about marriage. And it’s one man, one woman, forever, to bring about new life. We gotta do better to try to dis – take that away from being anti-anybody. LGBT couples and families don’t need a “skim milk” serving of love and support from Cardinal Dolan and the Catholic Church; they need religious institutions to stop pretending that LGBT people’s happiness is dictated by the rules of their churches, and to stop fighting against the basic rights all Americans deserve. Cardinal Dolan is correct to note that the Church is failing to connect with people, as a majority of American Catholics view their Church and bishops as “out of touch” with society. However, the Church will make no inroads on that front by attempting to frame the same old discriminatory policies which push people away in a more “loving” way. 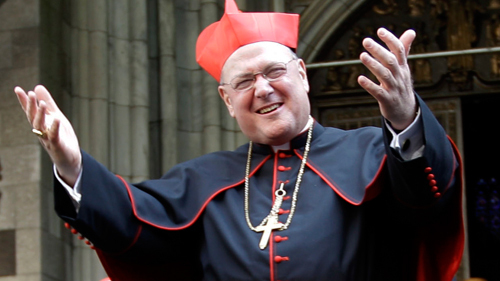 Cardinal Dolan was one of the strongest and most vocal opponents of marriage equality in New York state, despite the fact that a majority of Catholics in that state stood on the side of fairness and equality. Statements such as his ring especially hollow with informed Americans, considering the fact that the Church has still yet to take any meaningful action to put a stop to the constant flow of sexual abuse cases perpetrated by many of their own clergy. The opinions of Dolan and other religious leaders who share his view will only become more irrelevant to the people they consider parishioners, unless they search their souls and begin to truly preach a message of inclusion for all people, clean up their own house, stop trying to adjudicate people’s love lives and support policies which benefit all American families.